Language World 2017 – one month to go! 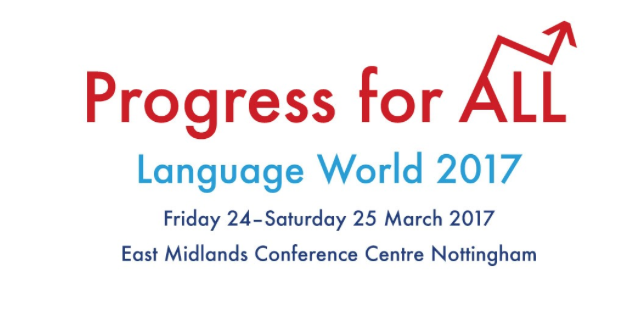 It’s one month to go until the annual Association for Language Learning conference, Language World. Have you signed up yet? Progression in the teaching and learning of languages is a priority for all teachers and ALL as a professional association as we respond to significant curriculum changes and developments at all levels. 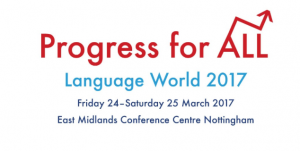 Progress for ALL is a deliberately broad title, as we aim to serve the needs of all conference delegates. For example, we are including sessions on promoting progress in all aspects of pupils’ learning of languages, ensuring progression in curriculum planning, sustaining progress in curriculum leadership and celebrating progress in building a culture of language learning in a school. During the two days there will be a mixture of plenary sessions, major talks and workshops with something for everyone from primary to higher education, and this year there is a slot for poster presentations which looks really interesting too. This year the conference takes place in Nottingham at the East Midlands Conference Centre which is very convenient for me living in the Midlands and once more in the ‘middle’ of the country. I’m looking forward to attending sessions and trying to capture them ‘live’ ready to post to the timeline in the exhibition area; a shame I can only be in one place at a time though as there are several slots where I’d like to attend two or even three sessions at the same time. If you’re interested in attending, the programme is below, and booking details can be found here. On Saturday 27th February, I delivered a workshop at the #ALLMFLSW16 conference in Bristol. 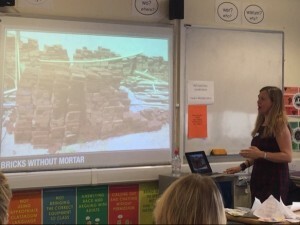 I’d been asked by Marie-France Perkins if I could talk about primary languages in the context of the new curriculum which is planned as a continuum from KS2 through KS3 and onto Ks4 and hopefully KS5. I called my session Building Firm Foundations for Strong Buildings, harking back to a talk I did a number of years ago called Bricklaying for Beginners! Below is my presentation, and under that I’ve written a brief summary of what I said. I hope you find it useful. If you have any questions, please feel free to comment or send a message via the contact form. I began by talking about the importance of foundations, and the role they place in keeping buildings upright and stable. Although they are often unseen, they are the last things that are destroyed by time and erosion; I shared my own experience of primary language learning and how my 4 years of middle school French have stayed with me. We moved on to considering why starting language learning at primary is so important before considering what should be taught/covered at KS2, referencing a survey by Clare Seccombe and also a document compiled by the ESAGMFL group. Looking directly at the Programmes of Study, we used Rachel Hawkes’ helpful “KS2 and KS3 side by side” document to look at the progression of skills and I shared the document below with participants, acknowledging the source as Rachel’s website. For me, my most important task as a primary language teacher is to nurture a passion for languages and an excitement about learning and communicating in other languages. That, however, does not mean that it’s all ‘fun and funky singing, dancing, cutting and sticking ‘ with no substance. There is a clear rationale to what I teach and I shared some ideas linked to each of the four skills as well as grammar. using songs as a way of introducing topics e.g. ¿Cuántos años tienes? branching listenings or minimal pairs (slide24)- I first encountered these last year at ILILC in a session by Julie Prince, and I shared two examples from LightBulbLanguages – colours (Spanish) and jobs (French) Learners listen to a series of words – or phrases – and at each step choose between two alternatives until they arrive at the bottom line and give the number they reached. PHONICS! So important! The keystones of the foundations as they enable understanding of the spoken word, pronunciation, enable learners to read effectively and also spell. Rachel Hawkes once more had burning ears! 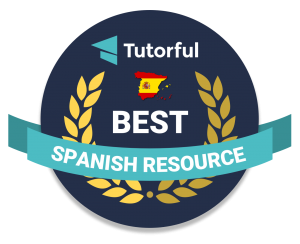 “Spanish glasses” to read Spanish – chocolate is spelt the same in English and Spanish but pronounced differently (slide 30 ) also false friends like gift and Gift in German. using Trapdoors to practice sentences – learners will play long after you’d think they’d be fed up! 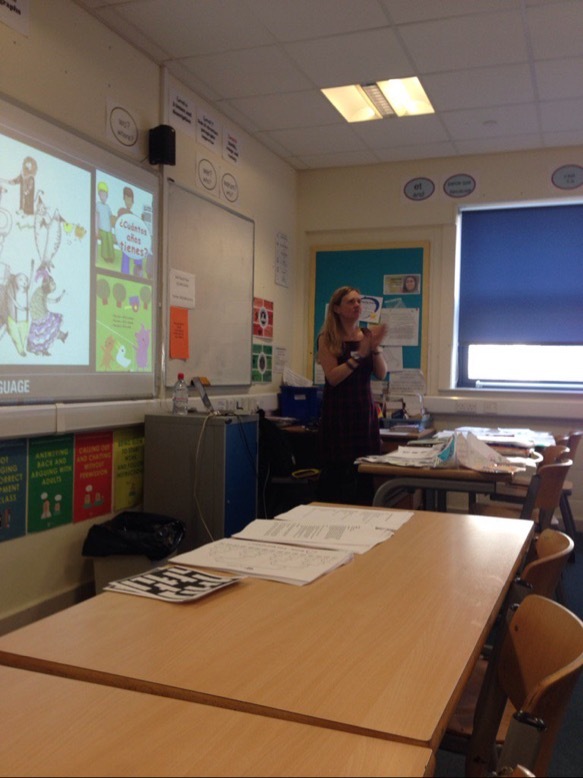 using storybooks isn’t a bad thing – even Y6 like a story, especially if you link it to reading to younger pupils or making something to be shared. books don’t have to be fiction – non fiction is important too. Books on e.g. planets can be accessed as learners have learned the facts in Science and can therefore make deductions about vocabulary etc. Plus there are diagrams and images to support. instilling the idea that you don’t need to understand every word, and linking in to literacy skills of comprehension: where will I find the answer? what are my clues? what’s the context? is there a word in the question that helps me? 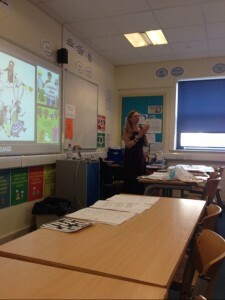 making your own texts using storybird.com – I shared ¿De dónde viene el yak? There are other MFL Storybirds shared on the wikispace both fiction and nonfiction. Well worth a look. dictionaries can be glossaries, picture dictionaries and encyclopaedia/thematic type ones as well as the ‘tradition’ bilingual ones. I shared an activity linked to a colour poem which Y3 had rewritten using a combination of picture dictionaries and bilingual dictionaries. Grammar is the cement that holds all the bricks together! using songs is quite effective e.g. ¿Por qué es mi mochila tan pesada? introduces Es+ singular noun and Son+plural noun – learners picked it up without me saying a word! making verb spiders or flowers – if you teach South American Spanish you can use a hand! verb drilling isn’t wrong – Y6 quite enjoyed it last year and treated it like a code or game that they conquered as they did it more! I then talked about the importance of promoting language learning in general and that no one language is an island – let’s celebrate the multilingual nature of our schools and draw out the experiences of our EAL learners. Comparing and contrasting languages is one of the things my learners enjoy more than anything else, and it’s language learning skills that are going to be key for their future success, especially as most of my learners will start a new language at KS3. I briefly highlighted the importance of including culture in whatever you do as languages need a context and it’s jot just about words! Finally we considered that not all foundations are the same – some are more basic than others i.e. some pupils will arrive at KS3 with less language learning, or perhaps with gaps in the expected knowledge (whatever that may be!) Some may have experienced lots of vocabulary and not much structure, some may have had a very sporadic language input, some may have encountered several languages and some only one. Whatever the experience, and however many ‘cracks’ there may be, my plea was to not destroy what has gone before but repair it, and shore it up. I’d categorise those three things as future learning at KS3 and beyond, wavering confidence as ‘it gets a bit serious’ and the ‘rising damp’ of adolescence! Ultimately, we want learners to ride those storms and sit proudly atop their magnificent linguistic skyscrapers, not falling like Humpty Dumpty never to be put together again! 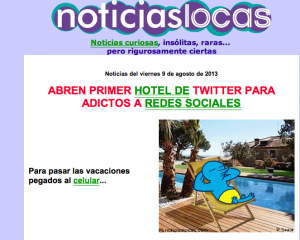 Have you discovered the Noticias Locas site? As the name suggests, it’s a collection of mad news items that makes a change from politics, crime and sport. Not just good news stories like Martyn Lewis‘ ‘And finally…’ but some absolutely bonkers ideas. Whilst some are of a slightly risqué nature (I’m amused by the kama sutra illustrated by sock monkeys but not sure I’d be thanked for bringing it to the attention of a class!) I think that many could be used in the KS3+ classroom for reading – they’re certainly “short texts” – and would certainly raise a smile or an eyebrow! Si son de esas personas que no pueden parar de tuitear, aún estando de vacaciones, este nuevo hotel, ambientado alrededor de Twitter, en Magaluf, España, es perfecto para ustedes. 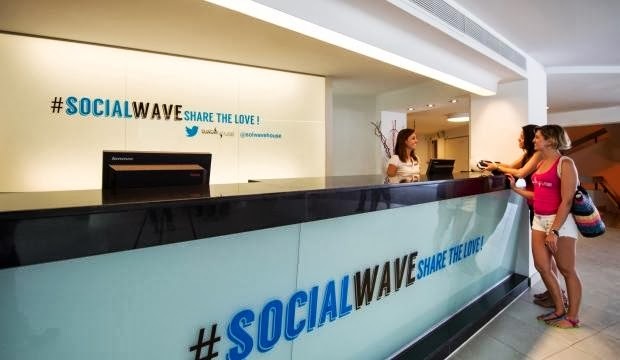 La cadena española de hoteles Meliá, tuvo la brillante idea de abrir un hotel en donde, quienes allí se hospedan, interactúen entre ellos y con el personal del establecimiento a través de Twitter. 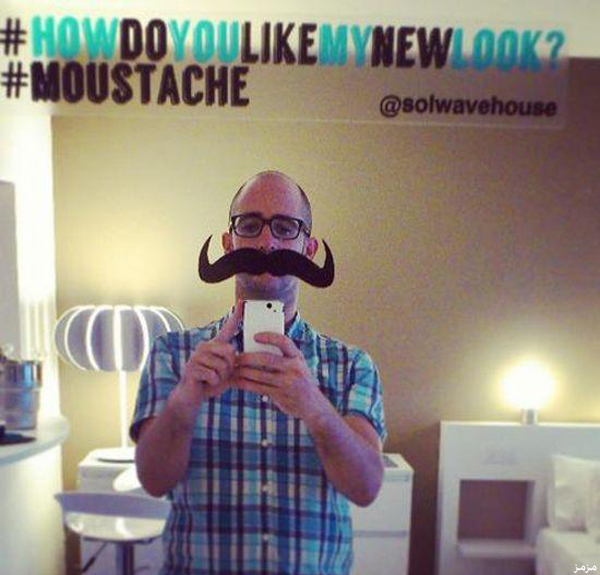 Gonzalo Echeverría, gerente general del hotel, explica que ¨es un nuevo paso que da nuestro hotel para satisfacer las expectativas de la gente¨, considerando que las nuevas tecnologías ya son parte de la vida cotidiana de muchísimas personas. Dentro de la comunidad virtual creada dentro del hotel, también se ofrecen juegos y distintos modos de entretenimiento, siempre dentro de las redes sociales. Así que si quieren conocer mucha gente nueva, pero a través de una pantalla, este hotel es para ustedes. Tony ¨Heladera¨ Phoenix-Morrison recorrerá 1.053 millas con una heladera de 42 kilos y medio en la espalda,, desde John O’ Groats hasta Land’s End, en Gran Bretaña. 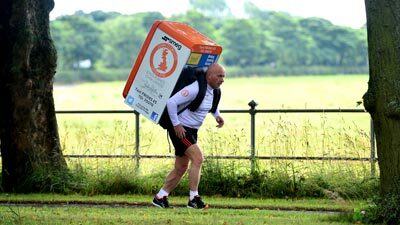 Esto quiere decir que este hombre de 49 años, con cuatro hijos y dos nietos, correrá el equivalente a 40 maratones, durante 40 días seguidos, acarreando un peso similar al de 40 ladrillos. Pueden pensar que está loco, pero ésta no es la primera vez que Tony corre distancias enormes con una heladera atada en la espalda. Ya varios lo conocen por las maratones que corrió juntando dinero para misiones solidarias. Aunque ya lo ha hecho antes, Tony admite que ésta será probablemente ¨la última maratón que corra con la heladera en este país¨, razón por la cual quiere que sea especial. También aclaró que ¨no está asustado en lo absoluto, pero hay algunas montañas y subidas en el recorrido que serán brutales¨. Ésta última carrera será en beneficio de la fundación Bobby Robson, así que le deseamos a la ¨Heladera¨Phoenix la mejor de las suertes. 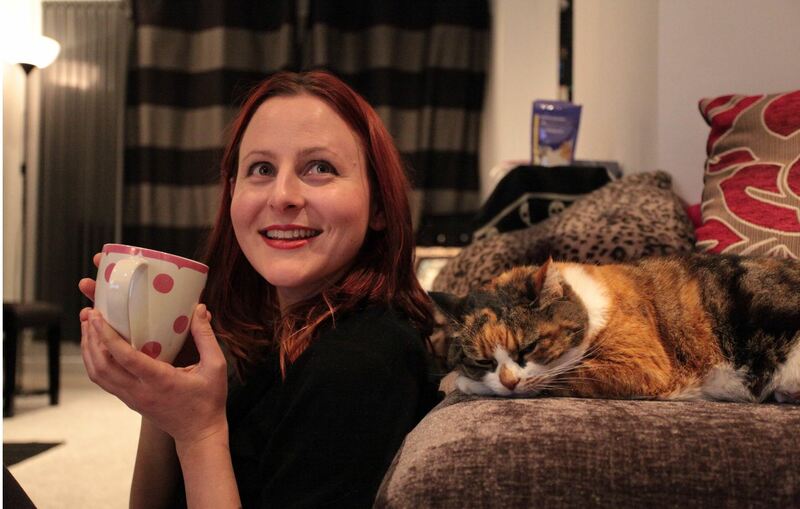 Luego de recaudar más de 100 mil libras en el sitio de financiamiento colectivo Indiegogo, Lauren Pears anunció que el 1 de julio abrirá su esperado ‘Cat café”. 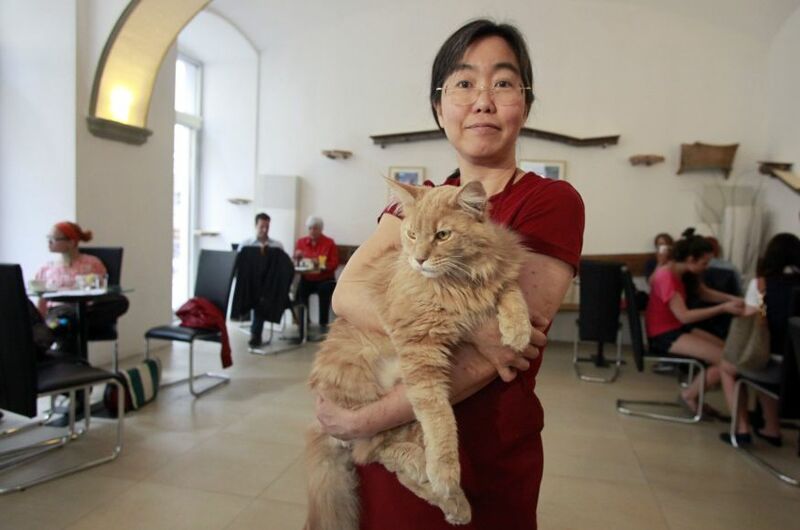 Aunque estos bares felinos son muy comunes en Japón, será el primero en Londres, por lo que Pears aprovechará la ansiedad de los miles de colaboradores y cobrará cinco libras por entrar al café, aunque no especificó si habrá tarifas para acariciar a las mascotas. La ‘loca de los gatos’, que tiene 30 años, dijo que “el plan es tener entre 10 y 15 gatos en el lugar, con un máximo de 40 o 50 personas al mismo tiempo y que la gente disfrute de un café en la compañía de un felino”, y agregó que tiene “más de 300 aplicaciones de interesados en trabajar en el local”. Por otro lado, la emprendedora no realizó comentarios sobre la caja de piedras que necesitará el nuevo café. I’ll leave you to discover other marvellous news stories such as the unusual chocolates produced by one UK company, the alarm clock that shocks you out of bed and the thieves that stole a goat just to give it a pedicure. Thanks to Liz Fotheringham last week for telling me about this wonderful site! Newsmap is an application that visually reflects the constantly changing landscape of the Google News news aggregator. Google News automatically groups news tories with similar content and places them based on algorithmic results into clusters. In Newsmap, the size of each cell is determined by the amount of related articles that exist inside each news cluster that the Google News Aggregator presents. In that way users can quickly identify which news stories have been given the most coverage, viewing the map by region, topic or time. Through that process it still accentuates the importance of a given article. What’s really great is that you can choose the country from which you’d like the headlines – the list includes Spain and Mexico as well as Germany and Austria which allow a comparison of headlines in the smae language. Canada is included as well as France but the headlines are in English! And there’s a tool bar at the bottom as well where you can choose the type of news that you’d like included. Another thing I like about this site is that if you hover on a headline, you get the beginning of the article plus a photograph. Just enough to give you more information about the headline, and just enough to be a ‘short text’. The ‘hover’ also tells you how many articles have been written on the same topic, and from which paper that headline came. And that’s just a quick think! I’m having a great time exploring. What do you think you could do with this site?